Pennant size is 9″ X 4”, made of durable felt. Proudly made in USA. My item is here and looks great, thanx! 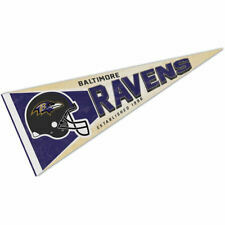 Baltimore Ravens Die Cut Pennant. Bring your wall alive with historic old-school Ravens style! Size: 12" x 30" Triangular Felt Pennant. Durable "Roll-it-and-Go" Felt Fabric. 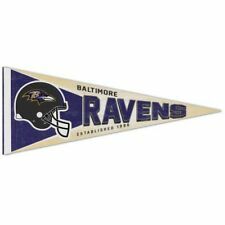 NFL Baltimore Ravens 12" X 30" Large Pennant. Fly Your Team Allegiance Show the Neighbors which team your Rooting for with our. Each item will include aNFL Approved Hologram which ensures quality construction, updated team logos, and authentic team colors. This is the Superbowl Champions logo pennant. SuperBowl 47. Baltimore Ravens. Logo Pennant. World Champions. And the best part is. . Which insures current insignias, wordmarks, and authentic colors. Made of Felt, and are single-sided screen printed. Official Wincraft pennant. Pennant is the Roll & Go style with GREAT graphics. A perfect addition to the Collector or Fan. BALTIMORE RAVENS vs SAN FRANCISCO 49ERS. SUPER BOWL CHAMPIONS ROLL & GO PENNANT. Official Wincraft pennant. Pennant is the traditional/ classic style with GREAT graphics. A perfect addition to the Collector or Fan. CONFERENCE CHAMPIONS PENNANT. BALTIMORE RAVENS. By Wincraft. Baltimore Ravens Felt Flag Pennant. The soft felt pennant 12x30 is in full color and is durable enough to Roll it and Go. Baltimore Ravens. FELT PENNANT. Felt pennants are the standard for sports. Made in the USA. PENNANT SLEEVES( item #300587735606). The pennant sleeves are 4 mil thick, soft polysleeves. YOU ARE BUYING. 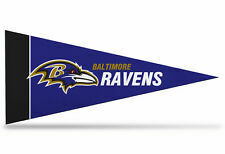 This is TWO different 12" x 30" full size pennants of the Baltimore Ravens. The NFL pennants also include a pennant sleeve on the left side which can be used to insert a pennant stick, if desired. Stiff Felt Pennant 4.25". Plastic clip 1.5"x3/4". Mainly for decoration. The back is plain white. 1 Ravens Super Bowl XLVII Champions Pennant (Full-size!). 1 Ravens Super Bowl XLVII Champions Decal/Sticker. FANTASTIC for the Baltimore Ravens fan in your life! Set of 8 Mini Pennants. Made of 100% Acrylic Knit Felt. This is a 12" x 30" full size signature pennant saluting the 2013 Baltimore Ravens Superbowl XLVII Champions. The NFL Pennant also includes a top stick sleeve which can be used to insert a pennant stick, if desired. · Applique and Embroidered single-sided Garden / Window Flag with beautiful color and graphics. It is the ONLY premium quality Applique and Embroidered Mini-Flag on the market! Great for the garden, hanging from the window and MORE! This is TWO different 12" x 30" full size pennants saluting the 2013 Baltimore Ravens Superbowl XLVII Champions. Makes agreat gift for any Ravens fan! This is a 12" x 30" full size pennant saluting the Baltimore Ravens vs the San Francisco 49ers in Superbowl XLVII. Stand not included. Made of weather resistant hevvy-weight nylon. Makes a great gift for any Ravens Fan! This mini pennant is the perfect decoration for a party, kids room, rec room, a bar, or anyplace imaginable. Each pennant is 4"x9" in size and made of felt. They feature your favorite team’s colors and design. NFL Football Team 30 x 12 Felt Pennant. there is NO OTHER WAY to send these from Alaska to you without more damange. Made in the USA. SUPER BOWL CHAMPIONS ROSTER PENNANT. Official Wincraft pennant. Pennant is the traditional/ classic style with GREAT graphics. A perfect addition to the Collector or Fan. BALTIMORE RAVENS. This set of eight mini pennants is the perfect decoration for a party, kids room, rec room, a bar, or anyplace imaginable. Each pennant is 4"x9" in size and made of felt. They feature your favorite team’s colors and design. ONE BALTIMORE RAVENS GO RAVENS PATCH. · Premium 3'x5' Size, Pennant Design. · Heavy Duty NYLON applique embroidered construction. · BEAUTIFUL colors and graphics.